Puree the garlic cloves. Scrap down the sides and add the remaining ingredients. Puree. Add enough water to make the hummus the desired consistency. Add additional seasonings if you wish. If you want to be like me (it’s hard for some to resist), sweep up the hummus that remains in the food processor with a carrot. I live with a dear friend whose body does not enjoy gluten, so I made a gluten-free tart for dinner tonight. 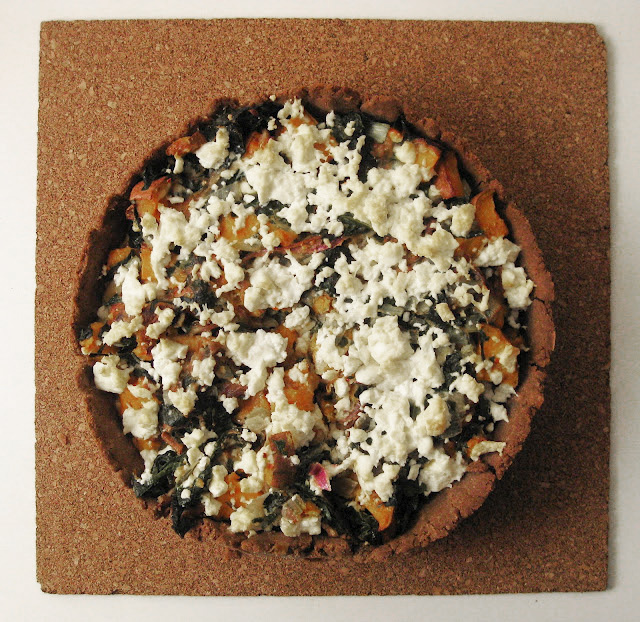 The crust included teff flour, which neither of us had ever eaten. Another gluten-free friend had given it to me when he left the country, so I had it on hand. I can now tell you that teff flour is made from a tiny grain native to Ethiopia. It is high in protein, iron, and fiber and has an earthy flavor. I made crust dough and cooked the onions and sweet potatoes last night, which I would recommend or start cooking early the day you wish to enjoy the tart. 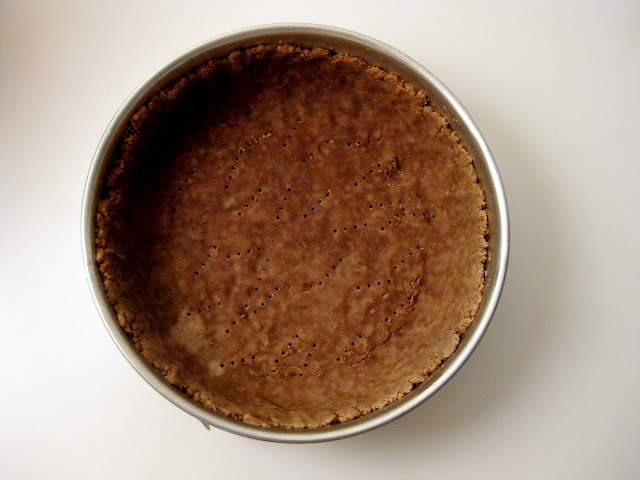 Grease a 10-inch deep-dish tart pan with a removable bottom or a springform pan. Mix all of the crust ingredients together. Pour the dough in the pan and press it down, starting in the middle, to form a crust of even thickness with 1-inch or 1 1/2-inch sides. Prick the crust all over with a fork. Cover it with plastic and refrigerate it for 1 hour or overnight. Preheat the oven to 375 degrees. Put pie weights or dried beans upon parchment in the crust. Bake the crust for 10 to 12 minutes until it begins to pull away from the edges. Remove the weights and bake it for another 3 or 4 minutes just until the crust is dry. Let the crust cool before adding the filling. Mix the sweet potatoes with enough olive oil to coat them as well a pinch of salt. Roast them in the oven until a fork can pierce them easily–about 15 minutes. Let them cool. Meanwhile, heat 2 tablespoons of olive oil in a large frying pan. Add the onion and cook them oven medium-low heat, stirring often, until they caramelize–about 35 minutes. Add the balsamic vinegar and continue to cook them until the liquid has evaporated. Transfer them to a bowl. Add some olive oil to a frying pan and cook the garlic over medium-low heat until it begins smell heavenly. Add the Swiss chard stems and cook them for a few minutes. Add the rest of the chard and cook until the leaves are wilted. Turn the heat off and add the onions, sweet potatoes, 1/3 of the cheese, a 1/4 teaspoon of red pepper flakes, and some freshly ground pepper. Whisk the eggs in a bowl and then add them to the mixture, stirring to combine. Pour the filling into the crust and then crumble the remaining cheese on top. Bake for 35-40 minutes at 375 degrees. These may look deceptively simple, and possibly even basic, but they got rave reviews from all tasters this weekend. 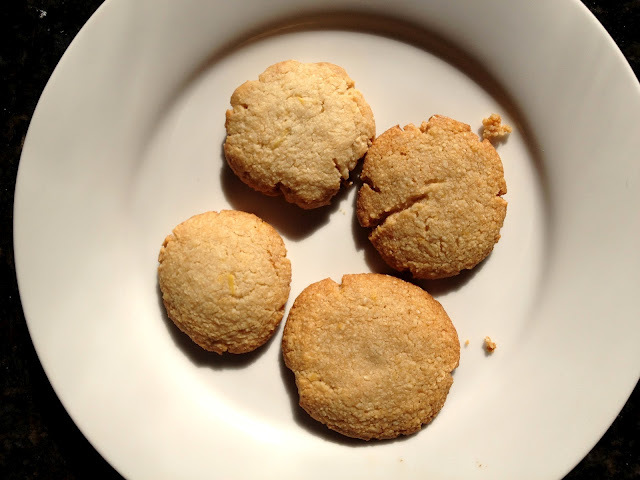 I’ve made a version of these bars before from Karen DeMasco’s book, The Craft of Baking, but they were much more buttery and shortbread-like. This version is lighter. The recipe called for jam, but I was all out and had a quart of fresh strawberries, so I roasted them with raw sugar and a pinch of salt. The kitchen smelled amazing and the fruit gets jammy and dark-edged. Mixed with more raw sugar, they make a much better substitute for jam. They have a deep roasted flavor and I think using fresh fruit is the key to making these bars great. The dough seemed too crumbly to hold together at first, but press it carefully into the pan, and once they cool, I recommend refrigerating them overnight. Once they have chilled, they hold together perfectly. Preheat oven to 325 degrees. Slice and quarter your strawberries. 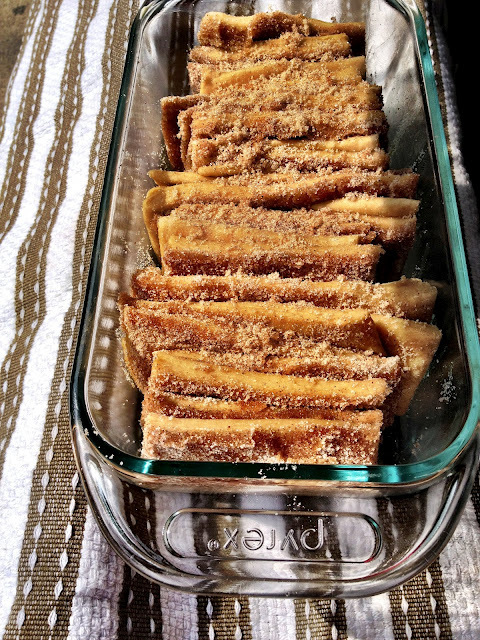 Toss them with the salt and raw sugar and spread them on a parchment lined baking sheet. Bake for about 30 minutes, until jammy and starting to brown on the edges. Increase oven to 375 degrees. Butter and line an 8 inch round baking dish (I used a cake pan; you could substitute a larger dish for thinner bars). In a stand mixer with the paddle attachment, beat together the flour, oats, butter, sugar, baking powder and salt (you could also do this by hand). Once the dough is crumbly and well-mixed, press 2 cups of the dough into the pan. Make sure it is all pressed down. 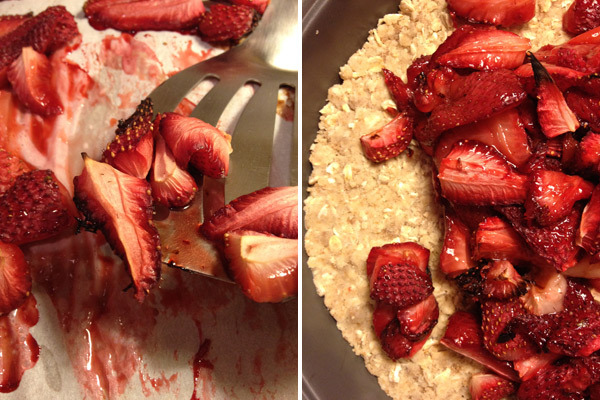 Add the roasted strawberries on top with a couple extra tablespoons of raw sugar (depending on how sweet you like it). Mash the strawberries into a jammy layer. Add the remaining dough on top and press lightly. Bake for 25 minutes, until the top begins to get golden brown. If you eat it warm, it will be a little looser in texture. So perhaps over ice cream? With cream? Go wild. I love ginger. I love the smell and the pleasant burn in my throat when I consume it in large quantities. This smoothie can be tweaked to your liking as you go along. It’s refreshing, creamy, and packs a ginger-y punch! Puree all and adjust the ingredient amounts until you’re satisfied! Whisk the almond flour, baking soda, and salt in a large bowl. In a smaller bowl, combine the coconut oil, honey, lemon juice, and lemon zest, mixing well. Pour into the dry mixture and stir until everything is well moistened, the dough will be slightly crumbly, but should hold when pressed together with hands. Lay out a piece of parchment and use your hands to sort of squeeze the dough together and transfer to the parchment. Carefully roll into a large log about 2 1/2-inches in diameter. Place in the freezer for 1 hour or until firm. You can freeze the dough overnight or for a few days. Make sure to thaw it slightly before you use it. Preheat oven to 350°F and line a baking pan with parchment. 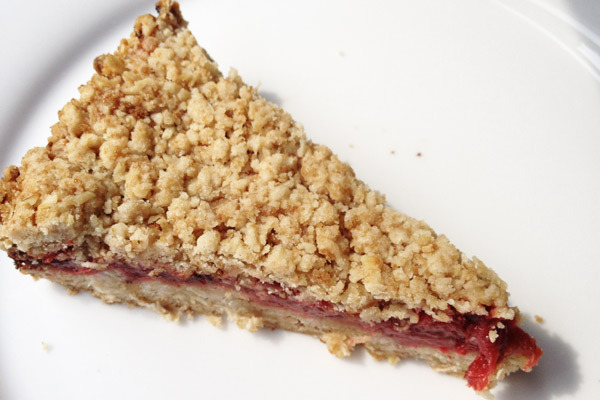 The dough is tough to slice because it crumbles very easily. You can either pinch of pieces and roll them into balls, which will give you a shape like the second photo above, or you can unwrap the chilled dough and cut into 1/4-inch slices, then lay the parchment back over each slice, one at a time, and roll it out flat with a rolling pin. Then they will look more like the top photo (I prefer this method). Place cookies on lined baking sheet and bake for 8-10 minutes. Make sure to check after 8 minutes, and take them out once they start to brown around the edges. Allow to cool on baking sheet for at least 5 minutes before transferring to cooling rack, as they are very delicate and will break if they aren’t cool yet. A few years ago, the New York Times published an article on a cookie dough recipe. 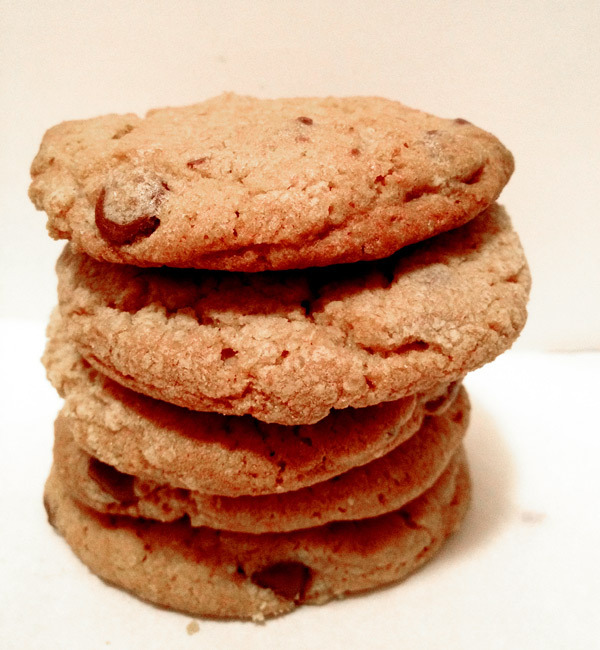 While chocolate chip cookie recipes are pretty much everywhere these days, the recipe was unusual because it has you refrigerate the dough for at least 24 hours. Apparently this gives a much better flavor to the cookies, and also in my opinion gives you a chance to try and see how long you can hold out and practice restraint with a bowl of cookie dough in your kitchen. I’d read elsewhere about adding malt powder to cookie dough as a good flavor addition. Personally I am a SERIOUS ADVOCATE of adding Grape-nuts to cookies, so I figured trying another add-in couldn’t hurt. I couldn’t find straight malted milk powder, so I used Ovaltine (total childhood throwback). Highly recommend these cookies–they are the soft, slightly crispy variety but not the chewy, flat variety. Feel free to increase the amount of malt powder, but if your powder (like Ovaltine) includes sugar, you might want to dial back the amount of regular sugar in the recipe. 1 1/4 sticks unsalted butter, room temp. In a stand mixer, cream the butter and sugars together until light and fluffy. Add the eggs and vanilla and beat until well-combined. In a separate bowl, whisk together the flours, baking soda, baking powder, salt, sugar and malt powder. Slowly add the dry ingredients to the stand mixer, beating until incorporated. Add your chocolate chips and any other additions you like (coconut, Grape-nuts, raisins). Refrigerate your dough for at least 24 hours. Cover in plastic wrap to keep it from drying out. I’d seen this bread in several places and wanted to try it. Not just because it is beautiful, as you fold pieces of cinnamon-sugar-dusted dough together in a loaf, but also because it is bakes up gooey-ly together in a way that even a pan of cinnamon buns can’t. Several words of wisdom regarding this bread: a) make it for friends, because people will ooh and ah over it, and it is nice to make that happen for people you love and b) don’t use a small loaf pan! I did, and as you will see, it overflowed in a very comical fashion (delicious, yet comical). Once you tackle the method (sounds complicated, but isn’t), you can make many variations on this (like garlic and cheese, or lemon and ginger). 1. 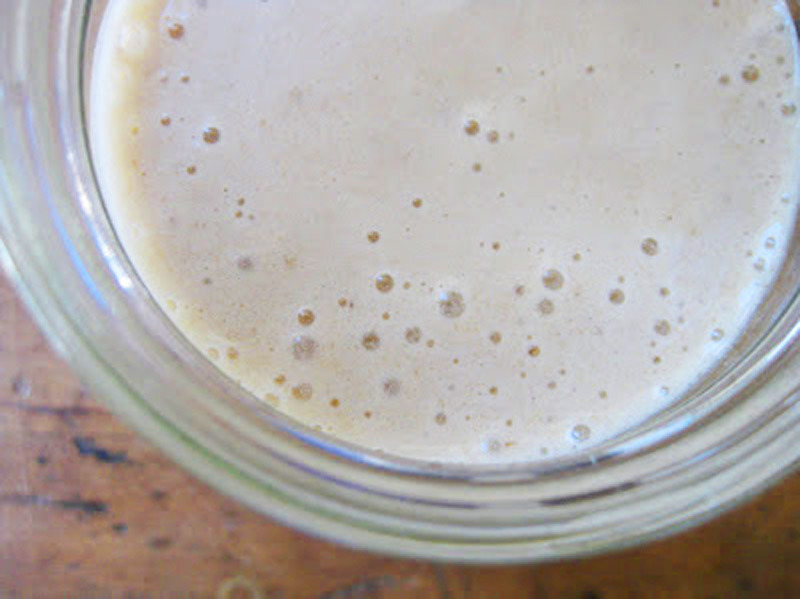 Whisk yeast into 3 tablespoons lukewarm water. Add a pinch of sugar and let sit for 5 minutes until it foams and bubbles. 2. In a large mixing bowl, whisk together 2 c. flour, sugar, yeast and salt and set aside. 3. Whisk together eggs in a small bowl. 4. In a saucepan, melt together the milk and butter until butter just melts. Remove from the burner and add water and vanilla. Let it stand for a minute. 5. Pour the milk mixture into the dry ingredients and mix until incorporated. Add the eggs and mix into the batter. This will take a bit! Add the remaining flour and mix into a sticky dough. 6. 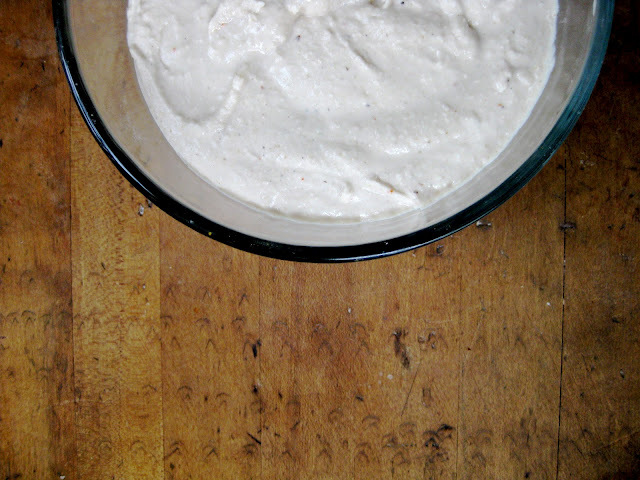 Place dough in a large greased bowl and cover with a towel. Let it sit in a warm spot until it doubles in size, about 1 hour. 7. Deflate the dough and knead 2 tablespoons flour into it. Let it rest for a few minutes. On a lightly floured work surface, use a rolling pin to roll out the dough into a large rectangle (try and do 12 x 20 inches). 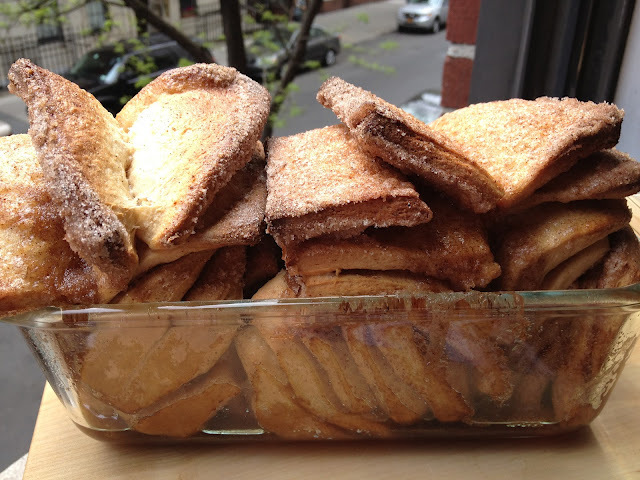 Brush the melted butter across the dough and sprinkle with cinnamon sugar. 8. Slice the dough vertically into 6 strips and stack them on top of each other. Then slice in 6 equal slices (you end up with 6 stacks of 6 squares). Layer the squares into the loaf pan. Place a towel over the pan and let it rise for about 30 minutes. 9. Preheat over to 350 and bake the loaf for 30 to 35 minutes. Let it rest for 20 minutes or so before you take it out of the pan, or eat it warm straight from the pan!